Hey - I have a weekend free - what better to do than to check this mighty thread? I'm sure the wise leaders here have already discussed it, but I'm always sitting in the back of the classroom reading science fiction. Beware of viruses in USB because with some update, if automatic playback was disabled, it is activated again. Do you connect your system to a domain controller? If so does the setting revert after you disconnect from the domain controller? I assume you have installed KB967715 and KB971029? Note This setting appears in both the Computer Configuration and User Configuration folders. If the settings conflict, the setting in Computer Configuration takes precedence over the setting in User Configuration. and I can't figure out why MS has so many articles describing use of the wrong key! that is described later in the same article. You might need to repeat the steps in https://www.bleepingcomputer.com/forums/t/437944/how-to-disable-autorun/#entry2556075 for each USB stick you own, kinda tedious, and what about new sticks you do not yet own or haven't gotten around to adjusting settings for? The symptom is caused by C:\Documents and Settings\<account>\NTUSER.DAT and C:\Documents and Settings\<account>\Local Settings\Application Data\Microsoft\Windows\UsrClass.dat do not have access permission for corresponding service account.﻿ I located those 4 files and set them to inherit the permission from parents, restart, and problem solved. I had initially tried adjusting permissions on just those 4 files. It reduced, but did not completely eliminate the event log errors for my system. For me the problem did not completely resolve until I also adjusted the rest of the folders as indicated. YMMV. 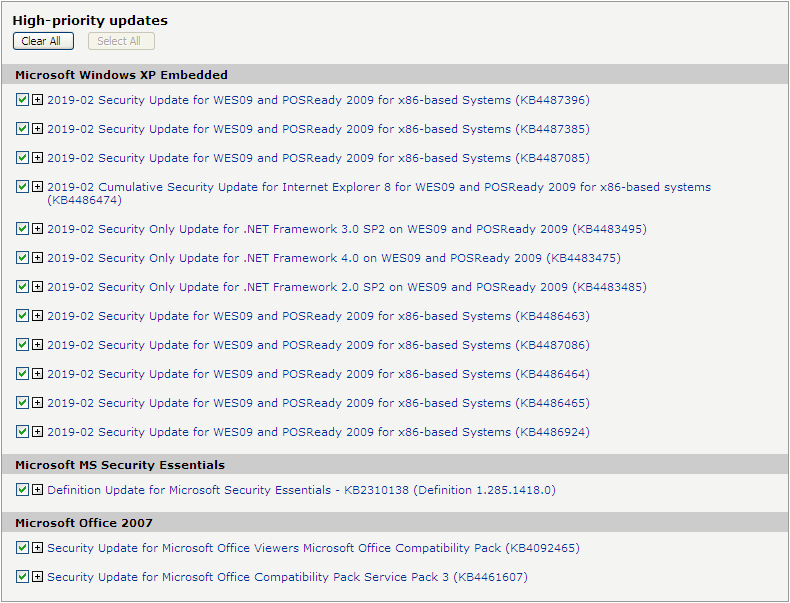 For some users, KB4486463 may cause installation problems because part of the kernel will be updated. If necessary, execute manually with the parameter "-o". "The procedure entry point sprinttf_s could not be located in the dynamic link library msvcrt.dll." The second error message appear to be for the nVidia driver software. I removed KB4487085 and things seemed corrected. I've had to do that quite a few times before with updates, but only on my netbook, not on my main machine. They appear to install, but don't as they can't replace some files, and are then offered again. "The procedure entry point sprinttf_s could not be located in the dynamic link library msvcrt.dll."" I removed KB4487085﻿ and things seemed corrected. Thanks for the post,i've had the same problem with lightshot,also is it related to the mspaint and picture viewer not working properly too? I also used the recommended /O switch and the results were the same. I saw the crappy message below, too, and DaemonToolsLite 4.45 (important) and two other uninportant start-up programs crashed in flames!